Julia Brumbaugh is an associate professor of religious studies at Regis University in Denver, Colorado. She holds a PhD from Fordham University in contemporary systematic theology. She is active in the Catholic Theological Society of America, where she is co-convener of the Women's Consultation in Constructive Theology. Her teaching and writing focus on spirituality and ecclesiology. "These essays call for a cosmological theology that will help us transform, reimagine, rethink, and live in a new sustainable relationship with the world and all that is in it." "Far more than a festschrift, this volume in honor of feminist and ecological theologian Elizabeth Johnson attests to the multi-modal, multi-generational impacts that radiate from the theological work and mentorship of this esteemed scholar. With essays ranging from cosmos to earthly embodiment, from bonobos to the Anthropocene, and from Christology to ethics, Turning to the Heavens and the Earth is a delightful testimony to frontiers in theological thinking that have been charted by Elizabeth Johnson. Essays in the book brim with insights, and the volume as a whole coheres beautifully." "If you love Elizabeth Johnson and her work on cosmic theology then you will gain wonderful insights and inspiration from this book. If you are passionate about Earth and nurturing this gift, then this book will give you added encouragement and a sense of hope." "Younger theologians might call Elizabeth Johnson a `rock star.' Although that is not a theological category, I think the celestial metaphor is fitting for the stellar scholarship she has generated over the decades and that, in turn, has attracted a constellation of colleagues, peers, students, and others to do theology that simultaneously orbits the tradition while boldly exploring new space(s) for understanding the One in whom we `live and move and have our being' (Acts 17:28). Humans, nonhuman animals, and indeed all of creation are encompassed in this `we' as reflected in the light that these essays emit as a tribute to Johnson's gravitas. Now as we face urgent environmental issues and as we extend our human footprint further into our solar system's small corner of the galaxy, the theological work offered in this collection is indeed most welcome." "A profound achievement of Turning to the Heavens and the Earth is the simple fact that, unlike so many festschrifts, the fifteen essays contained herein read as a seamless communion, building upon one another and repeatedly referring to Johnson's wisdom as the inspiration for each unique contribution. This book makes certain that theology can no longer shadow or veil the cosmos in its dealings with the mystery of God." "From beginning to end, this book is a formidable example of what theology—done in relationship and en conjunto—can contribute to cosmological consciousness, conscience, and conversion. Indeed, it is a timely testament to the compelling reasons why, as Elizabeth Johnson says, `You just have to keep doing theology!'" 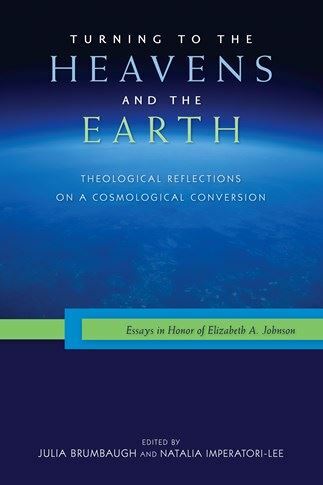 "This is a fine collection of essays in honor of the redoubtable theologian, Elizabeth Johnson, with social attention paid to Johnson's lifelong, major contributions to the central issues of God, humankind, and cosmos. A fitting and welcome tribute to a splendid theologian."